It’s been a quiet few months on my blog, but things have been busy this summer. Between exhibitions in Vancouver and Edmonton, there have been travels as well as dressmaking and a wedding! I’ve just recently started a new painting in the studio, and with the sudden change in weather here in Vancouver, I’m reminded of that back to school feeling. So I guess you can kind of think of this blog post as my first day back to school, and here’s what I did this summer. The group exhibition, Now & Then, at Pendulum Gallery was well received, with their new gallery walls and light system in place. 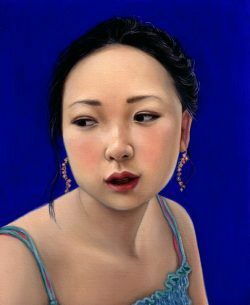 It’s a great place to show work as I think it receives more foot traffic than many galleries I’ve shown at, and the more eyes, the better. You can read more about the exhibition and gallery space in Vancouver is Awesome here. For the last year and a half, Mary Porter and I have been collaborating on a project. We’ve known each other for almost 15 years now, meeting when we were both on exchange in Paris. Over those 15 years we have perhaps only lived in the same city for 12 months total. But we’ve managed to keep in touch and stay good friends, as well as collaborate on smaller projects on and off over the years. This culminated in our project, A Conversation, which we showed this summer at Latitude 53’s ProjEx Room. Working from images found through Google Image Search, Mary and I made digital collages based on our text conversation using the first 20 images for each search. The results were convoluted but patterns emerged through common images and text. We showed the images as a video projection on opposite walls in the space, where viewers sat in the middle as we “spoke” to each other from either side of the room. A Conversation will be showing in December at Truck Gallery’s Window Space in Calgary, Alberta. Last but not least, my fiancé and I got married this summer. Early on in the planning stages, I saw a dress I loved but it was from a few years back and impossible to get a hold of, not to mention way out of my budget. Against my better judgment (or despite it! ), I decided I was going to make my own wedding gown, even though the last time I sewed a dress was when I was 14 and in Home Ec class. I figured…how hard can it be? It was just another art project to tackle! The thing is, I wanted a simple shaped dress, which I had a hard time finding in shops, but I also wanted flowers on it. So I got down to painting with watercolours, practicing roses in a painting medium that I wasn’t used to. After many botched attempts, I finally worked it out and scanned the image and had it printed onto satin. From there, I made a mock up dress in a cheap fabric using my own pattern that I created by looking at photos online of the original dress I liked and, no joke, Gwyneth Paltrow’s pink dress that she won her Oscar in. I think all my problem solving skills for creating art, from the planning stages to the end results, helped me a lot in trying to figure out my dress. Working on my kitchen table at home while trying to keep the dress a secret was hard, and it also meant doing fittings and trying to see what the dress looked like on and from behind meant many awkward selfies in the mirror. In the end, after a couple of fitting hiccups, I finished the dress and even made it convertible into a shorter party dress for the reception. The wedding couldn’t have been more perfect. And after a happily stress-free wedding, my husband and I left for a quick honeymoon in California. We spent a few days in Ojai, and all the cacti we saw inspired my new work, which has been commissioned by The New Gallery in Calgary for their fundraiser later this fall. The drawing will be made into a silkscreen print. I will post more details in upcoming months. This is part two of my photo diary of my last trip of 2014 – around the world in three weeks. After the last leg of our trip in Prague, we flew, via Paris, to Tokyo. I haven’t been back to Asia in over 10 years, and I haven’t been to Japan since my early teens. This was definitely the favourite part of my world trip. We didn’t nearly have enough time to see everything, and I definitely hope to be back soon to spend more time exploring the country. Here are some photos from my short but memorable trip to Japan. We arrived in Japan just in time to catch the tail end of their Autumn Colour festival, with beautiful leaves changing colour around the city, even though it was already mid-December. Tokyo is a huge city and we barely scratched the surface on our too brief trip. Perfectly wrapped & pretty – $60-70 each. We watched them make candy – look at the detail! Once we got to Kyoto, we headed straight for Arashiyama, as we had luckily timed our arrival with the start of their light festival. The bridges, streets and hills were all lit up, with lanterns lighting the path way to the temples and through the bamboo forest. This last part of our trip was definitely dedicated to seeing temples and gardens. 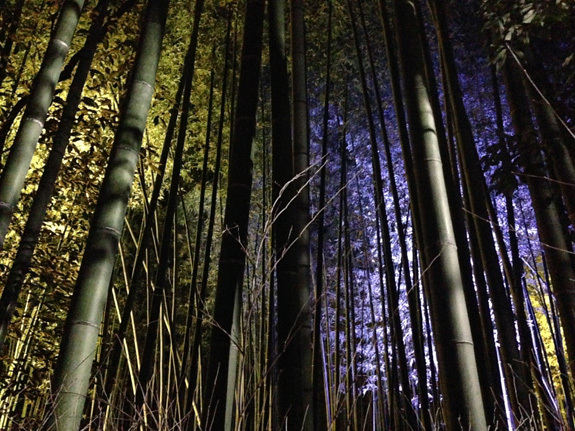 The bamboo forest lit up during the Arashiyama light festival. One of the most delicious meals I’ve ever had was Italian in Kyoto, at Ristorante Dei Cacciatori. Matcha and genmaicha ice cream parfaits to celebrate the end of our world trip! And there you have it. We traveled 3 different continents, 5 different countries, 6 different cities, in a little over 3 weeks (a couple of days were spent flying). It was truly the trip of a lifetime, and it was daunting when we first booked it and thought about how many places we were going to in such a short time. But once we were actually traveling, I think our excitement overrode our jet lag and we were usually out from morning to night, walking all day long. I saw and experienced so many new things, I’ve collected lots of ideas along the way and am keeping them the sketchbook in my head for future works. It will be interesting to see how things I saw from this trip will find their way into my future art. For more pictures from my trip, you can check out my Instagram. Happy New Year! It’s hard to believe that it’s already 2015. You may have noticed it got a little quiet toward the end of last year on my blog. I ended the year on a big whirlwind trip around the world…in 21 days. Earlier last spring, an amazing (unbelievable!) flight deal came up that my fiancé and I couldn’t turn down. So late November, we embarked on a once in a life time trip that saw us fly from Vancouver to New York and then on to Milan. From there, we trained to Vienna and Prague. And then flew to Tokyo, took a bullet train to Kyoto and then flew home to Vancouver. We did this all in 3 weeks! This was my first time to New York during the Thanksgiving/Christmas season. I also got to experience the madness of Black Friday first hand. While a lot of museums and galleries were closed, we did get to catch a few shows in Chelsea. Making the most of being in the city during Thanksgiving, we went to see the Macy’s parade and walked by all the fancy Christmas windows at the department stores. I felt like the entire city was glittering. We spent most of our time in Milan wandering the streets, popping into different churches and shops, and just enjoying the city. One of the highlights was seeing Da Vinci’s The Last Supper…no photos of that allowed, but I was amazed by the sheer size of it. Much larger than I expected, at about 25 feet high by 29 feet across. Some new friends I made along the way. I was really looking forward to this part of the trip because I wanted to see all the different Klimt and Schiele paintings. My favourite was the Beethoven Frieze by Klimt at the Secession Building. We spent every day museum hopping and kinderpunsch drinking at Christmas markets. An excellent way to spend chilly days. A man riding a little gold turtle! We caught a ballet…with dizzyingly high seats in the nosebleed section. We took the train from Vienna and after the last week and a half of rushing around, we decided to take it easy in Prague. We had four days to wander the streets and take a bit of a breather. The city was packed with tourists, so we spend a lot of time winding down side streets and along the river in this picturesque city. With the European leg of our trip wrapped up, we flew via Paris to Tokyo. This post is getting a bit image heavy, so I’m going to leave our Japanese adventure for the next blog post, which I’ll put up in the couple of days. 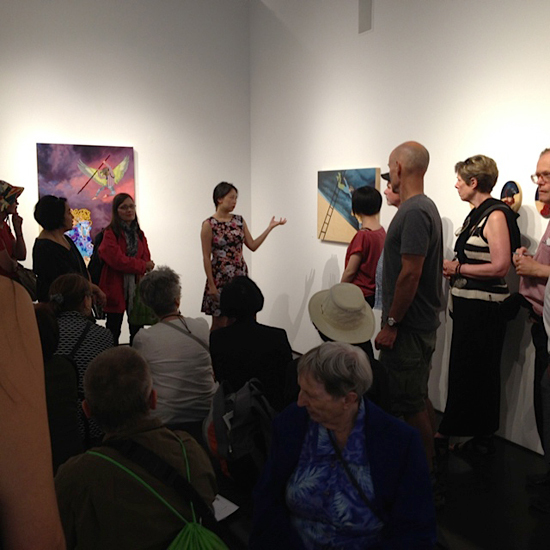 My artist talk at Initial Gallery. Photo by Julie Lee. 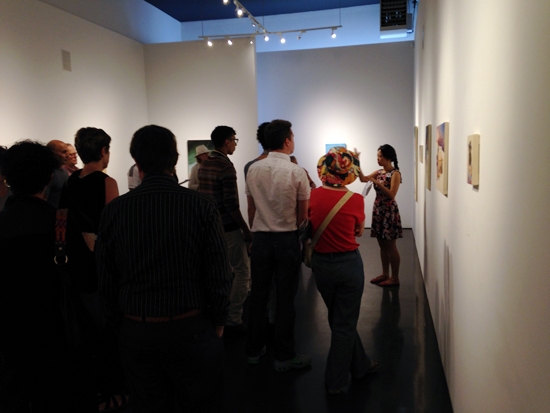 My exhibition, Of Myth and Men, opened last week, and it was a great success. 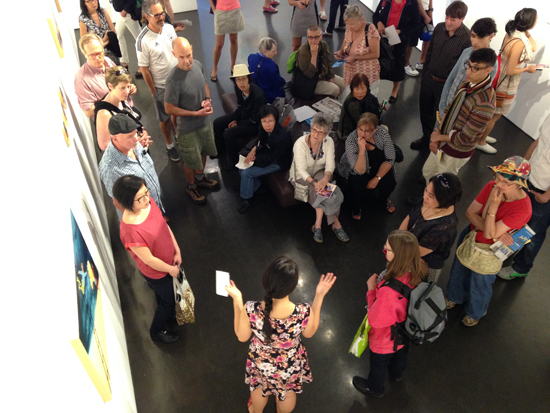 People braved the sudden rainstorm and made it out Thursday night to see my exhibition. 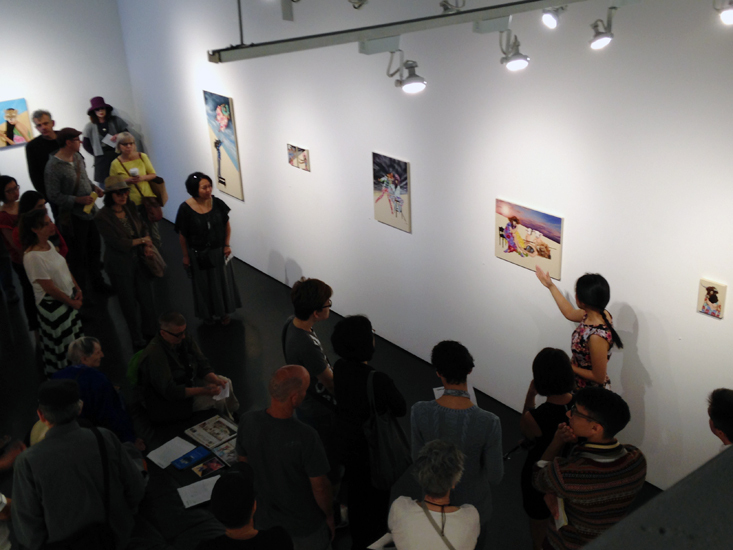 Thank you to everyone who came out and also to those who visited the show on Sunday as part of the Granville Street Art Walk. 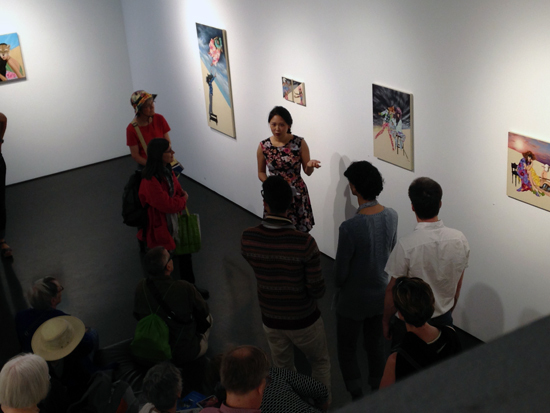 I gave an artist talk at Initial Gallery, and with the sun shining outside, there was a great crowd coming through the gallery all day long. 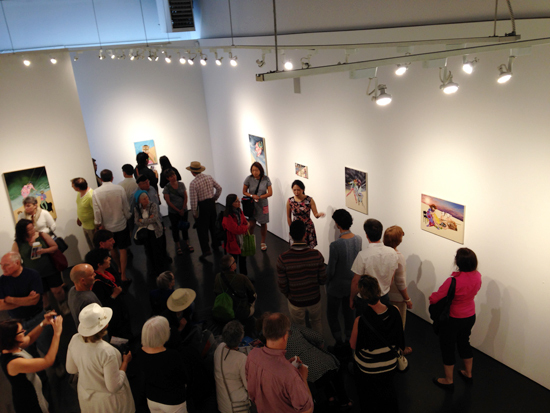 A big thank you to everyone who came out to see the show. Of Myth and Men is up for another couple of weeks, until July 5th.